Nathan P. Gilmour , 5 February 2014. It’s funny how pendulums (pendula?) shift. In my own relatively brief lifetime (as I write this I’m 36), and as I’ve taught and interpreted the Bible in a range of contexts, I’ve come to be a danger to one sort of literalist who thinks that all this postmodern stuff will undermine the immutable authority of “the Bible,” and I’ve come to be a danger to another sort of literalist because I wonder out loud whether “Biblical scholarship” is the monolith that such folks assume when they throw around that phrase. In neither case do I blame those who regard my reading practices as dangerous; after all, political momentum relies upon large groups of people who agree, and never is political momentum more in danger than when most folks agree that this or that ideology is ascendant. So someone like myself, with a Socrates complex, is hardly ever welcome at anyone’s party convention. In other words, if you enter a room and find a consensus with regards to a shared Biblical text, and you’re inclined to shake up the terms of that consensus by means of close reading and interrogating the prevailing assumptions about practices of reading, you might just be doing it right. That doesn’t mean that folks are going to like it; after all, among other things, the New Testament is a record of strong conflicts rooted in Biblical interpretation. 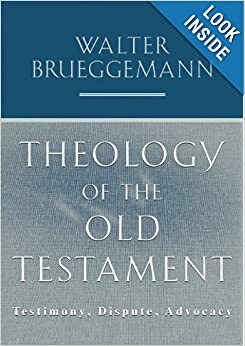 But, if Brueggemann is right (and my hunch is that he’s right), that ongoing process of re-reading, often in tension with the readings that come before, is precisely what a collection of texts like the Old Testament calls for. My own relationship to that idea has changed over the years. There was a time when, confronted with a strong consensus, I would openly declare that Bible interpretation is an ongoing community activity and that disagreements are part of communities’ health, then I would get to offering a counter-reading. These days I’m more inclined to jump right to the troubling details and let folks think that they discovered the anomaly in the system, then let them figure out that interpretation has just occurred. Perhaps I’ve become sneakier. Perhaps I just don’t have the chops for pitched battles any more. But whatever has changed, I imagine that, as years and decades roll along, and as I keep preaching and teaching and reading and remembering the text of the Bible, I’m going to keep re-discovering what’s there precisely because the Bible doesn’t sit still, and neither do I. The ways that I used to read the Bible are part of my memory now, and they’re not going anywhere. The ways that I’ll interpret the same this week, teaching classes and preaching sermons, will be the memories of a future moment. Such is not to say that any interpretation is as good as any other: that’s where the responsibility comes in. I have to name the moments when, giving my best effort, I still made life worse rather than better because I insisted upon a reading that the moment didn’t demand or, even worse, failed to insist on a reading that the word did demand. Such responsibility is at least part of what the New Testament calls confession of sins, and I do make such confession a practice. But when I’ve confessed, I know I’m not out of the game yet. That’s not how it works. Instead, knowing that the possibility lies open for another bad reading, and another course of life that’s harmful rather than helpful, the responsibility of each of the faithful, and I’m in that number, is to let our sins be strong, doing what the Scriptures call for, ready to confess if the voice we’ve heeded (or not heeded) renders us once more sinners. Thanks for your gracious invitation to share, Walter. I’m glad we share ’em too.